The United Methodist Church’s Council of Bishops has requested a declaratory decision from the church’s Judicial Council (its “Supreme Court”) on the question of what petitions can be submitted to the special, called General Conference meeting in St. Louis, Missouri, February 23-26, 2019. The question raised by the request is time sensitive. Petitions for the 2019 General Conference must be filed by July 8, 2018. The Council of Bishops (COB) has asked the Judicial Council (JC) to convene a special meeting to make a declaratory decision. The Judicial Council has granted this request and scheduled a session for May 22-25, 2018. Petitions for the special 2019 General Conference must be filed by July 8 so they can be translated, printed, and distributed to the 864 global delegates. The delegates, and all the people of the church will be afforded the opportunity to read, study, and debate the petitions prior to the 2019 General Conference. In St. Louis, the delegates will decide what petitions, if any, they wants to approve. In its filing with the JC, the COB asks whether petitions may be submitted to the special General Conference that “are not consistent” with the COB report. Some argue that the call is so restricted that the only legislative proposal that can be filed by July 8 is what the COB proposes. The COB plan will propose changing the Book of Discipline in either substantive or structural ways to address the decades long conflict over the church’s sexual ethics, definition of marriage, and ordination standards. I believe such a restriction is contrary to a prior JC decision. In 1964 the General Conference called for a special session of the General Conference to be held in October 1966, “at the time, and if practicable, at the place of the Evangelical United Brethren, 1966, General Conference for the sole purpose of reviewing and acting on questions of church union” and a report. The JC was asked, “Should petitions . . . from the church at large be permitted.” It appears to me the same question is now being asked again. Therefore, according to the Discipline and Decision 227, any United Methodist member or group has the right to file a petition to address the ways in which the General Conference might “act upon” the COB’s report. Such petitions would properly be before the special 2019 General Conference as long as they were submitted by the stated deadline for filing them. Delegates to the 2019 special General Conference should have several options before them when “acting upon” the report from the COB, just as the 1966 special session had several options regarding church union. The 2019 General Conference delegates can affirm, reject, amend or adopt a substitute for the COB report. I would argue that as long as other proposals are submitted in the proper form and by the requisite deadline for submission, they would properly be before the delegates. This would allow the delegates plenty of time to study and debate alternatives other than just the one the majority of the COB endorses. The special, called 2019 General Conference will meet for just four days. It will address matters so important to the church that COB has deemed it appropriate to call a special session. 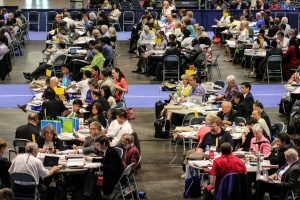 Every effort should be made to ensure that the General Conference delegates and all the people of the church have plenty of time to fully vet various options before the global delegates make a final decision in St. Louis. Any attempt to restrict proposals to just the one the majority of the COB proposes is contrary to both the Discipline and Decision 227. Such an approach would not be healthy for the church, and it would only serve to further diminish trust in the denomination’s leadership. The Wesleyan Covenant Association urges the JC to declare that any United Methodist member or group has the disciplinary right to file a petition to address the ways in which the General Conference will act upon the COB report. Rev. Keith Boyette is president of the Wesleyan Covenant Association, and an elder in the Virginia Conference of The United Methodist Church. He served as a member of the Judicial Council from 2000 to 2008.